It's fair to say that the laws & rules surrounding disclosure and bloggers can be interpreted in different ways and it's still a very grey area. Everyone has their opinion on what is the right thing to do and disclosure can be a difficult thing to get right. I'm not going to preach about what you should and shouldn't be doing as I think everyone is different and your blog is your business but I do want to share my story. First of all, on the outside it might seem like bloggers have a fantastic life. It may look like we're always eating out 'for free', drinking cocktails and generally having a good time. I will begin by saying that it is indeed a huge privilege to be invited to a restaurant and write a review. I genuinely adore writing restaurant reviews and I don't think I could ever stop writing them. I still write restaurant reviews when I haven't been invited somewhere and love to share when I've visited somewhere nice. Restaurant reviews are probably my favourite type of blog post to write. However, A LOT of work goes into writing a restaurant review. First of all, you don't just suddenly start getting invited and it doesn't happen overnight. You need to have spent time building an audience, establishing your blog and you will usually have written lots of restaurant reviews about food you've paid for yourself before receiving your first invitation to dine. Writing a restaurant review takes time. There's the time taken to photograph your meal, edit your photographs, research the restaurant and then type, publish and market your post. I reckon by the time you've received a £30 meal, the work involved is definitely the equivalent to less than minimum wage. I'm really not trying to sound ungrateful (because I am very grateful) but I just wanted to set the scene a little. When those review requests do start landing in your inbox, you are SUPER excited and genuinely can't believe that a restaurant would like you to dine at their establishment 'for free'. You can't wait to share this with the world. If you look at some of my early blogging posts my disclosures are very loud and proud - almost boastful in a very cringy way. You just can't believe this is happening to you and you want to share it with the world. I am still thrilled when a restaurant invites me to write a review but after writing around 20 restaurant reviews, I started to worry about what people would think. Did they think I was only in it for the freebies? (I'm really not by the way). I started to feel guilty about eating out and not paying. I would also really begrudge attending the same press dinner as a group of journalists and then reading about it in their magazine or newspaper with absolutely no disclosure and failed to see how I was any different - why did I have to disclose a paid for meal when the mainstream press didn't? I still don't understand why this is the case if I'm honest. Anyway, I digress........so for around 12 months or so, I didn't disclose when a meal had been paid for. Partly because I didn't think I needed to, partly due to embarrassment but also because other bloggers didn't either. I know I was wrong to do this now but blogging is a huge learning curve and I'm not afraid to hold my hands up and say I got it wrong. The Advertising Standards Agency state that if bloggers (or any other media/press) have a relationship with an advertiser (in this case the restaurant) then it should be disclosed but is a 'review' a relationship? It's technically not a sponsored post as no money actually changes hands and the brand has no control over what I write. However there is a relationship as I've been invited. This is where the grey area comes into play. A few months ago I was shocked to read that if you paint the illusion that you paid for a meal when you actually didn't then this can be a matter for trading standards and you could find them knocking at your door. Eeek! I'm not really sure if bloggers are aware of this? I know it's not something that is widely discussed in the blogging community. Back to today though and for the past 6 months or so I have always disclosed if a meal has been paid for and I am pretty sure that's the way it's going to be forever now. If I'm honest, my change of heart isn't because of the law but it's down to me now being comfortable enough to say that this is my blog, I've worked hard to get where I am and I am proud of it. Plenty of people have their opinions on bloggers dining out on comped meals and are pretty forthright about theses opinions but I am at a stage now where I honestly don't mind if people say we are 'blaggers' or whatever. I know this is far from the truth. Building an audience of 30k+ people takes a serious amount of work and I know that I offer excellent value to the restaurants I work with and I have received lots of lovely messages from readers who try somewhere new after reading about it through North East Family Fun. I think that's something to be proud of and in the wise words of Taylor Swift, 'Haters gonna hate, hate, hate, hate.....' and like Taylor, I just shake it off. I don't always write glowing restaurant reviews if they've been paid for (see here for example) and I always try to write about the good and the bad plus note how other diners are treated. I do understand however that sometimes as a blogger, I may be on the receiving end of better service ect...... which is why I think full disclosure is always the best route to go down - transparency is key and I think most people will realise that I can only ever write a review based on my experience. I don't claim to be doing it the right way and I don't judge how (or if) others disclose. I've been there myself! I just wanted to share my way and what works best for me. I'd love to hear what you think too. I don't always get 'freebies' as a food blogger, but when I have been invited I state so. Based on the number of reviews I do the huge majority are paid for out of my own pocket, & even those I've been compensated for don't guarantee a glowing write-up, as The Treehouse in Alnwick will attest! I totally agree with you! Before blogging I didn't realise how much time went into writing a post at all and I think most readers won't get this unless they blog themselves. If the meal was truly 'for free' then I wouldn't have to write about it. I do always disclose because I am always interested to know that myself when reading a review. I love that you disclose and I love the honesty in your reviews. And I have definitely gone to places and had a lovely time based on your recommendations so thanks! I always disclose, whether it is a review where I have received the item for free or is it is a paid for feature. That said, legally, you don't need to disclose even if you received a review item for free as long as it is a fair review. I just think disclosing is good manners and the right blog etiquette. This is a really interesting post, I bet it'll help a lot of people too! Very interesting article. 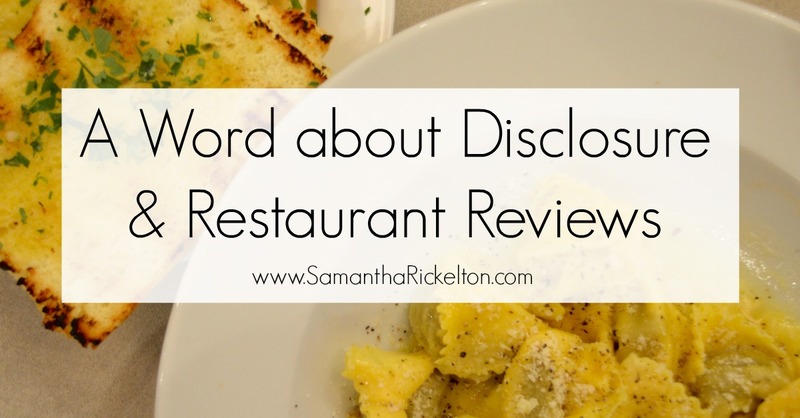 I had no idea some bloggers didn't disclose when they were invited to a restaurant to review it. I am trying to get into a little bit of food blogging and this post is actually so helpful! To learn from other peoples struggle is such a big privilage! Your posts was so helpful! I get invites for restaurant reviews all the time. I decline however, as food blogging is not in my niche. Fair enough. It's pretty simple really: if you got something in exchange for a review you really should say so, regardless of the legal bit. What publications have had "proper" journalists get comped and not then disclose that? That seriously does stink. I get invited to places and I always say I've been invited, I think my disclosure is pretty obvious even if I don't always specifically mention it in those words. Photography is an expensive commodity in itself and I can tell you that my hourly rate as a photographer is about 900% more than it is as a blogger, that's a conservative estimate, it's probably even greater but I still love my blog because it's me, my opinion and a valued opinion that people read and I think we as bloggers are so much more valued than traditional journalism which is why we must be honest in our reviews, I've said honest things when places weren't the best and I'll continue to do so. I loved going out with you for that meal but saw on that day what you had to do in return. You weren't relaxing with cocktails and a meal with a friend. You were working! It was a fantastic experience though, seeing how someone else lives, on the other side of the camera as it were! There will always be those that complain, but it reflects more on them than it does on you.